It's Cyber Week! That means Walmart has some of the best deals going on right now! There are great prices in lots of different categories, so you can always start by visiting Walmart.com and checking out all the front page deals! 1. Graco LiteRider Priscilla Click Connect Travel System with SnugRide Car Seat $99 :: was $149 :: save $50! 2. Graco LiteRider Signal Click Connect Travel System with SnugRide Car Seat $99 :: was $170 :: save $71! 3. Summer Infant In View Duo Monitor with Bonus Camera $99 :: was $189 :: save $90! 4. RollPlay Battery-Powered VW Ride-On Bus $99 :: was $159 :: save $60! 5. 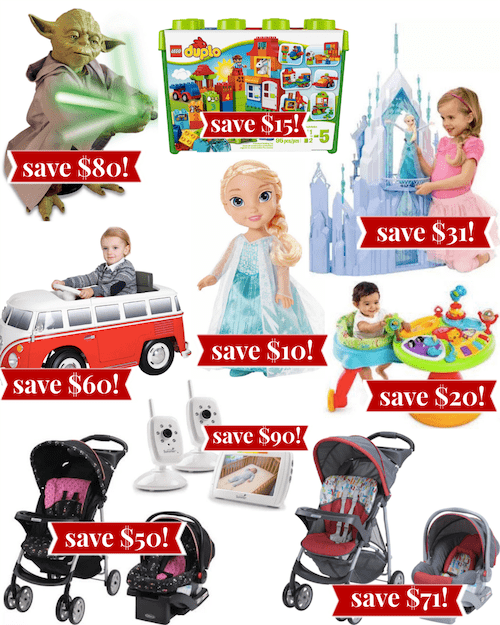 Frozen Elsa Toddler Doll $15 :: was $24.97 :: save $9.97! 6. Bright Starts Zippity Zoo 3-in-1 Around We Go $69 :: was $89.98 :: save $20.98! 7. Star Wars Legendary Jedi Master Yoda $99 :: was $179.97 :: save $80.97! 8. LEGO DUPLO Deluxe Box of Fun $64.99 :: was $79.99 :: save $15! 9. Disney Frozen Elsa Ice Castle $99 :: was $129.97 :: save $30.97! These are only a handful of the offers that Walmart.com has going on for Cyber Week, so be sure to check out their entire Cyber Week selection! Remember, you can shop online and pick up your order the same day at your nearest Walmart store if the items are available when you select In-Store Pickup! There are no shipping charges for in-store pickup, too! If you'd rather skip a visit to the store, you'll also get free shipping to your home if you spend $50 or more at Walmart.com.